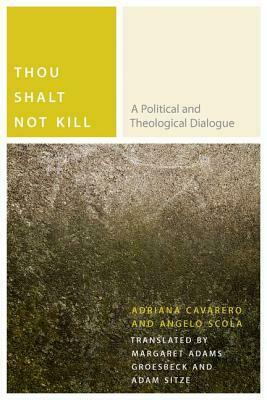 In this fascinating and rare little book, a leading Italian feminist philosopher and the Archbishop of Milan face off over the contemporary meaning of the biblical commandment not to kill. The result is a series of erudite and wide-ranging arguments that move from murder and suicide to just war and drone strikes, from bioethics and biopolitics to hermeneutics and philology, from Theodor Adorno and Max Horkheimer to Hannah Arendt and Michel Foucault, from Torah and Scripture to art and literature, from the essence of human dignity and the paradoxes of fratricide to engagements with Levinasian ethics. Less a direct debate than a disputation in the classical sense, Thou Shalt Not Kill proves to be a searching meditation on one of the unstated moral premises shared by otherwise bitterly opposed political factions. It will stimulate the mind of the novice while also reminding more advanced readers of the necessity and desirability of thinking in the present.